Get Pre-Qualified in 48 Hours! Free Property Mgmt First Year! 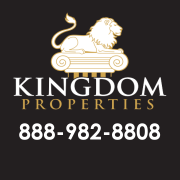 Kingdom Properties offers full service, turn-key, real estate solutions for buyers and sellers of Killeen TX Real Estate. Tim Gibson is the owner/broker of Kingdom Properties, his experience in the Killeen TX real estate market can be critical to the success of your real estate transactions. The Killeen, Texas real estate market is growing in demand, based on relocation and stationed military personnel at Fort Hood, the nearby military facility; as well as the great recreational and entertainment available in the area. From fishing, boating, and swimming at Lake Belton to the many area golf courses, the Killeen TX real estate market has a lot to offer. Kingdom Properties is dedicated to providing the highest quality of customer service to all of their Killeen TX real estate clients. With the current state of the nations real estate market, now is the perfect time to invest in the Killeen real estate market, with the $8,000 dollar federal tax credit, the lowest interest rates in years, and some of the lowest home prices the Killeen TX real estate market has seen in decades, now is the time to buy! Below are some featured homes for sale in Killeen Texas. If you don't see what you're looking for, please use our MLS Search to view all Killeen TX real estate listings. Copyright © Kingdom Properties - all rights reserved.